Range suitable for use in a Salon (Beauty, Barber, Massage), Spas, Restaurants or Medical. 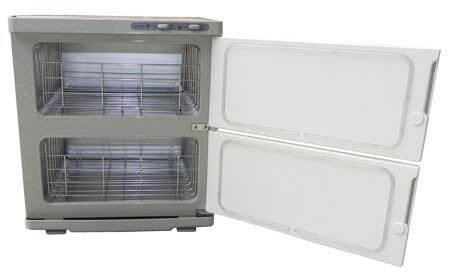 Two door 32 litre model. (#CAPR032). Sorry - this item is not currently in stock. Holds a capacity of 32 litres (2 x 16 litres). Shelves inside each cabi can be taken out. 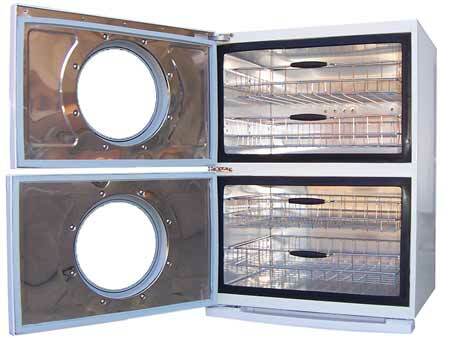 Heats to a max temperature of 70 - 80° C.
Drip tray can be taken out. Separate power buttons for each unit. Power details - 240 volts, 50 Hertz, 320 watts. A twelve 12 month warranty applies. Outside: 41 x 44 x 44.5 cm (L * W * H). Inside: 33.5 x 33 x 15 cm x 2 (L * W * H). Best results with facial cloths. Ensure that they are not dripping wet. Be careful when removing the contents as they may be very Hot. 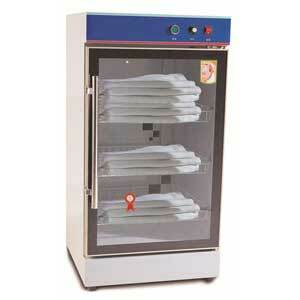 Hot Towel Cabinet (30 litre) - CAPH009. This unit has been stocked since 2007. 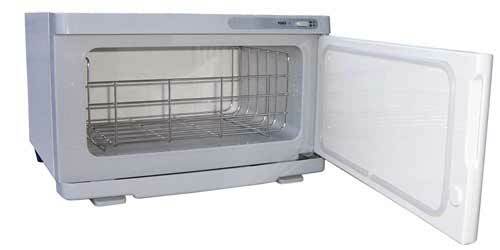 Slightly smaller than the CAPR032 unit and therefore a little cheaper in price. 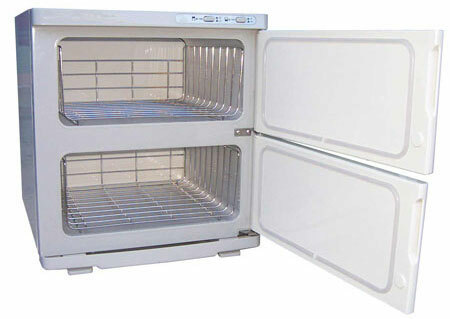 One removable tray inside each 15 litre compartment. Each compartment works independantly of the other. External colour is white rather than the traditional gray. Main customers for this unit have been from the Massage industry. You can buy these Warmers as well as other Beauty equipment, delivered within Australia. Payments accepted online with PayPal. Mastercard and Visa also processed. Payments can also be made via Bank Transfer or Cheque. Specific details details are available on request on (02) 6162 1950 or email us. equipment can be checked out at our store based in Canberra .